With the ATM boys, Daniel Han, expert defender Jonathan Kim and transfer Mark Otto as seniors, along with up-and-coming sophomore Ryan Park and the addition of Coaches Justin Ernest and Blair McCullough, the boys’ 07-08 season looked to be very promising. Appearances turned out to be reality as the boys experienced there best season ever, peaking with a Far East banner in tow. With wins in the regular season against a strong Deagu team, they faltered slightly in the tournament with a loss to the ever-challenging Warriors, placing them 4th for the season and tournament. The boys would, however, meet the Warriors once again on a bigger stage. The season was led by the dominating middle presence of center Daniel Han, who received all-conference and all-tournament honors for the season. The team’s record was a Division I school record of 22-8. Far East was greatly anticipated by Coach Epps and the team. It would be held at Daegu and would include home team Daegu, pre-tournament favorite EJ King, and 4-time consecutive Far East champion Faith Academy. The team struggled in the pool stage of the tournament as there was some dissension within the team. The boys fell behind in a sloppy first half against EJ King but pulled together as a “family” in the second half after being challenged by coach Epps. Although the game ended in a loss, the Guardians looked like a different team from that point forward. The biggest win of the tournament came the first day of bracket play against the home team Daegu Warriors, who the Guardians had lost to just a couple of days earlier at the KAIAC tournament. The team stayed composed in the midst of the roaring home crowd and without leading scorer James Lee (leg) and came out with a solid 10 point victory. This victory was led by senior Kildong Kim, who had his first career triple double. The team then beat Faith in a convincing 15-point semi-final win. The boys would have a chance to meet the only team that had beaten them in the tournament so far, EJ King. 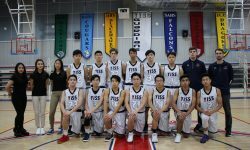 Led by sophomore Ryan Park’s 23 points and all-Far East center Daniel Han’s 25 points, the Guardians just proved to have too much fire power for the Cobras. The boys won fairly easily over the favorites to take home the banner! All-Far East honors also went to Daniel Dong-young Kim, Jonathan Kim, and Kildong Kim.